Hi! I'm Sunshine. I'm all webbed up for Halloween - can you tell?? There's a lot to do here! Weave your way through my web - if you can! But, watch out for the Spiders!!! If you make it through, you can claim your prize! Good luck - you'll need it! He he he! I've got lots of Halloween links for your pleasure, too! And, if you like fun cat pages to see, visit my home, Sunshine's Site! I've also got lots of pictures and fun things to do! CATS, REMEMBER TO STAY INDOORS ON HALLOWEEN - IT'S DANGEROUS FOR US!! 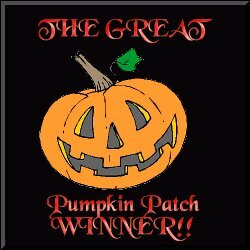 I was a winner in the Petsburgh Pumpkin Patch Halloween Contest in 1999!! 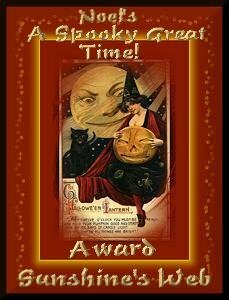 I received this award on September 30, 2000, from Halloween Noel - Thanks!